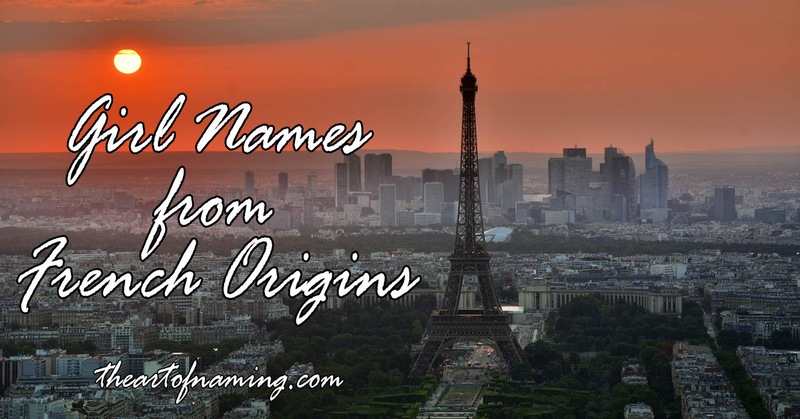 Here are some interesting girl names that originate from Norman French or Old French origins. These have a variety of popularity and usage levels in the US. Amarante - Taken from the Amaranth flower, this is the French form of the name. It comes from the Greek amarantos meaning "unfading". This is a very rare name. It has been used a total of 23 times on record for boys, and none for girls, but the most recent year it was used was 1933. This means it is ripe for the picking! It deserved to be renewed as a fresh floral name for girls. Avril - This is the French form of April which possibly comes from the Latin aperire meaning "to open" referring to the opening of flowers in the springtime month. Avril first gained recorded usage in the US in 1919. It has never been common but began gaining more births per year around 2003, presumably in line with the popularity of singer Avril Lavigne who hit the scene in 2002. Blanche - From a Medieval French nickname meaning "white, fair", derived from the word blanc. This is a name that has fallen from its former glory. It was most popular in 1917 with 2,836 births for the year. It did very well before that time and just slightly after. It was on the decline by the 1930s and left the Top 1000 in 1965. These days, the name only has single-digit usage including 9 births in 2016. Could it make a comeback as a retro vintage choice soon? Cerise - This name comes from the French word for "cherry". The name Cherry itself isn't known for being the classiest choice, but Cerise is a great alternative. It is pronounced SU-REEZ. Cerise didn't have any recorded usage in the US until 1951, and even then, it has never had more 20 in a single year aside from 29 in 1955. There were only 5 girls given the name in 2016, which makes this a very rare option that lands in the food, color, and French name categories and deserves more usage today. Chantal/Chantel/Chantelle/Shantel/Shantelle - While it is now associated with the French chant meaning "song", it was originally derived from a place name meaning "stony". Chantal first gained usage in the US in 1947, followed by Chantel in 1957. Chantel became the more popular spelling, gaining a peak of 738 births in 1990, compared to Chantal's 428 births. Alternate spelling Shantel also received 486 births in 1990. Since the 90s, these names have all declined. In 2016, there were 28 Shantels, 18 Shantals, 28 Chantals and 41 Chantels born. There were 33 girls named Chantelle and only 11 Shantelles. Which spelling do you prefer? Désirée - This is the French form of desiderata from the Latin desideratum meaning "desired". Desiree first appeared in 1910 in the US, followed by Desirae in 1955. The late 1960s started an upward trend of popularity for both names which peaked between 1983 and 1992. Both spellings have declined since then. There were 282 girls named Desiree and 95 named Desirae in 2016. There are probably even more alternate spellings too. Esmé - In Old French, this name means "loved" or "esteemed". Esme is very much on the rise right now. It originally had very sporatic use in the US as early as 1913, but it didn't catch on regularly until 1980. In 2010, it entered the Top 1000 with 280 births. As of 2016, there were 426 girls given the name which is its popularity peak so far. I expect it will continue to climb. Estelle - Taken from an Old French name that was derived from the Latin word stella meaning "star". Estelle peaked in popularity in 1915 with 1,784 briths. By the 1930s, the name had half as much usage and continued to decline. It fell to double digits by 1966 but in 2004 it started to swing upward again. There were 339 girls named Estelle in 2016. Similarly, there were 302 girls named Estella. Fleur - This means "flower" in French". There's also the diminutive Fleurette. Fleur had 19 births between 1926 and 1933, 5 in 1956, 64 births between 1970 and 1982. And 84 births since 2002, including 12 in 2016. It may be on the verge of gaining increased popularity. Fleurette had minimal usage between 1915-1953. There were a few births in the 1970s, but the last time this name appeared on record was 1995. Jacinthe - The French cognate of Hyacinth, the name of a flower and a precious stone. It comes from the Greek hyakinthos. According to the Social Security Administration in the US, there has never been at least 5 births in a single year for the name Jacinthe. This is a rare name! Jolie - Meaning "pretty" in French, it is obvious why it is not actually used as a name in France. However in the US, it has been popularized by actress Angelina Jolie. The name first appeared on the charts in 1947. It had a good amount of use in the 1970s then again starting in the late 1990s. Jolie peaked in 2008 with 546 births for the year, declined a bit, and is currently trending upward again with 430 births in 2016. Lacy/Laci/Lacey - From a surname derived from the name Lassy which is a town in Normandy. It may come from the Latin Lascius. Surprisingly, Lacy is unisex. In fact, in 1927, there were 116 boys given the name and only 20 girls. Around 1975, their roles flipped. Lacy gained a boost of usage for girls and entered the Top 1000 while it declined for boys. 1982 had a high of 987 female births (and only 27 for boys), proving to be its best year yet. Popularity has waned since then. In 2016 there were 117 girls named Lacy and <5 boys. Lacey followed a similar pattern and is actually the preferred spelling now with 634 female births in 2016. Laci had 90 births. Which gender and which spelling do you prefer? Macy/Maci/Macey - Similar to Lacy, Macy comes from a surname derived from towns called Massy in France. It may come from a Roman personal name that was Latinized as Maccius. Macy dates back to the late 1800s for both genders but has always been more commonly used on girls. It entered the Top 1000 in 1990 and peaked in 2003 with 1,483 births. As of 2016, it was given to 628 girls for a rank of #490. Maci is even more popular! It was given to 1,185 girls in 2016 with a rank of #265. Macey is not used as much with only 211 births. Which spelling do you like more? Maëlys - The Feminine form of Maël which is the French form of the Breton name Mael. It originally comes from a Celtic word meaning "chief" or "prince". Maelys has only been on record in the US since 2008. From then until now, there have been a total of 69 females given this name, including 10 in 2016. The diaeresis mark above the "e" may discourage use so many of these girls may or may not have it included. The record lists it without. Marjolaine - This is a name that means "marjoram" in French, which is a minty herb. I like this name since it is reminiscent of Marjorie with the laine/line ending that is so popular. With the correct French pronunciation, it is MAR-ZHAW-LEN. Marjolaine was actually used in the US from 1922-1923 on record for a total of 11 births. This is another rare name. Noëlle - This is the feminine name derived from the French word Noël meaning "Christmas". Noelle has been on record since 1927 for girls. It is listed without the diaeresis mark above the "e", so it is unknown how many of these girls use it and how many are just Noelle. Either way, this name began gaining popularity in the early 1960s. It held steady for years until it gained another boost around 2012. In 2016, there were 1,260 girls given the name. Océane - Meaning "ocean", this French spelling is pronounced AW-SE-AN. It is quite rare. It first appeared on the charts in the US in 2002 with 6 births. It hasn't climbed much since then. In 2016, there were 10 girls given this name. Paris - The name of the capital city of France, which is derived from an ancient Celtic tribe called the Parisii. Paris, as a name, can be used in reference to a person hailing from Paris, France. Paris is unisex. It was used for males in the US since 1881, but it was not given to females until 1917 on record. It had similar popularity over the years for both genders, but starting around 1985, it leaned more in favor of the girls. Paris had a booming year in 2004 with 2,150 births, a record high for girls. Now it had 1,152 births for girls in 2016 and only 80 for boys. Reine - This name comes from the French word meaning "queen" and is pronounced REN. Reine has been consistently rare since the 1880s. It would get a handful of births, skip a couple years, then get a handful more, and repeat. It was not steadily used until 2007. In 2016, there were 12 girls named Reine. This spelling isn't popular, but there are similar names such as Raine, Raina, Rayne, Rayna and so on that have more usage. Reign is also popping up a lot. Rose/Roselle/Rosette/Rosine - Rose was originially a Norman form of a Germanic name composed of the elements hrod and heid. The Normans introduced it to England as Roese and Rohese. It was later associated with the Latin rosa and grew popular as inspired by the flower. Roselle, Rosette and Rosine are French forms and diminutives derived from Rose. Of course Rose is extremely popular and has always ranked in the top 400, its best years being around 1917. However, the other names are rare. Roselle had 12 female births in 2016, while Rosette and Rosine had less than 5. In fact, Rosine hasn't been used on record since 1961. If you want something unique but familiar-sounding, these names are for you! Tracy - A first name that was taken from a surname, derived from a Norman French place name which meant "domain belonging to Thracius". That refers to the Thracia region of Europe which is divided between Greece and Turkey today. Tracy is also sometimes a diminutive of Theresa, the French form being Thérèse. Tracy was more popular for boys until the late 1950s and early 1960s. In 1950 there were 178 girls named Tracy (#645 rank). In 1960 there were 5,768 (#84). But it was 1970 that exploded all over the charts. There were a whopping 18,468 girls named Tracy in 1970, which is a very impressive boost. It ranked at #10 that year. It declined again after that, leaving the Top 100 in 1985 and the Top 1000 in 2005. Now in 2016, there were only 92 girls named Tracy. This name will probably not return for several more decades, if ever. Violette - The French form of the name Violet which is based on the flower. Violette dates back to the late 1880s and saw decent usage around 1920. However, it grew rarer over time and was not used often until it gained a resurgence around the 2000s. Thanks to the popularity of Violet (#47 in 2016), Violette is now being used more than it ever was in the past with 196 births in 2016. 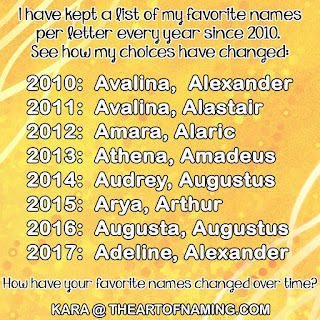 Which of these names do you like the most? Would you consider using any of them? Share your thoughts in the comments below!! Thanks for reading. 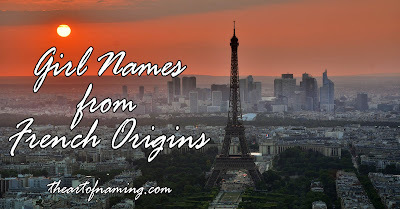 Check out French Names for Boys too!